These timeless stories about mighty Hercules, fearless Jason, and creepy-crawly Medusa have been told for generations. The world's secrets are revealed through magical mythological tales of amazing people, animals, and places- and these stories are sure to charm and excite readers who like fantastic and fun adventures. Perfect for the younger reader, Adventures of the Greek Heroes is a wonderful introduction to the rousing and rollicking world of Greek myths. 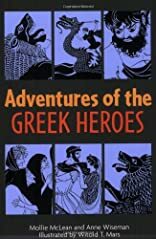 This exciting collection includes the adventures of Hercules, Perseus, Theseus, Orpheaus, Meleager, and the Argonauts. About Anne M. Wiseman (Author) : Anne M. Wiseman is a published author of children's books. Published credits of Anne M. Wiseman include Adventures of the Greek Heroes. About Mollie McLean (Author) : Mollie McLean is a published author of children's books. Published credits of Mollie McLean include Adventures of the Greek Heroes. About Witold T. Mars (Illustrator) : Witold T. Mars is a published illustrator of children's books. A published credit of Witold T. Mars is Adventures of the Greek Heroes.